A dividend growth portfolio is a sole way to maximize your total return over the long-term. By building a dividend growth portfolio, you increase your income without doing anything. A company continues to increase their earnings, which in turn they reward shareholders more. In addition, a dividend growth portfolio is a great way to combat inflation. 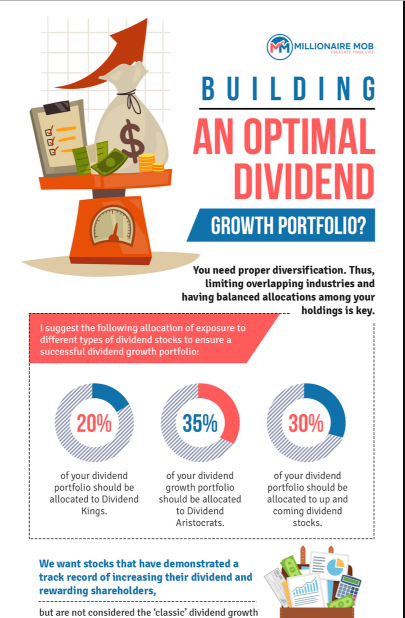 Our (Millionaire Mob) dividend growth portfolio infographic should help you get started to building a successful portfolio. The goal with our dividend growth portfolio is to hold onto it for life. We are long-term investors and not traders. By finding the right dividend growth stocks off the bat, you shouldn’t have to do much (OR ANY) work at all thereafter.